It has been requested that the title of this article be changed to List of governors of Vermont. Please see the relevant discussion on the discussion page. The page should not be moved unless the discussion is closed; summarizing the consensus achieved in support of the move. The Governor of Vermont is the U.S. state government's chief executive. As of 2015, Vermont is one of only two U.S. states (New Hampshire being the other) that elects Governors for two-year terms. 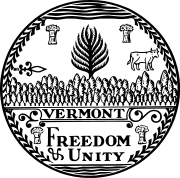 Until 1870, Vermont elected its Governors for one-year terms. This is a table of congressional seats, other federal offices, and other governorships held by governors. All representatives and senators mentioned represented Vermont except where noted. * denotes those offices which the governor resigned to take. As of April 2018[update], there are five former governors of Vermont who are currently living at this time, the oldest governor of Vermont being Thomas P. Salmon (served 1973–1977, born 1932). The most recent governor of Vermont to die was Philip H. Hoff (served 1963–1969, born 1924), in April 2018. The most recently serving governor of Vermont to die was Richard A. Snelling (served 1977–1985 and 1991, born 1927), in office on August 13, 1991. From the founding of the Republican Party in the 1850s until the 1960s, only Republicans won general elections for Vermont's statewide offices. One method that made this possible was imposition of the "Mountain Rule." Under the provisions of the Mountain Rule, one U.S. Senator was a resident of the east side of the Green Mountains and one resided on the west side, and the governorship and lieutenant governorship alternated between residents of the east and west side. Nominees for Governor and Lieutenant Governor were allowed two one-year terms and, later, one two-year term. For nearly 100 years, likely Republican candidates for office in Vermont agreed to abide by the Mountain Rule in the interests of party unity. Several factors led to the eventual weakening of the Mountain Rule, including: the long time political dispute between the Proctor (conservative) and Aiken–Gibson (liberal) wings of the party; primaries rather than conventions to select nominees; the direct election of U.S. Senators; and several active third parties, including the Progressives, the Prohibition Party, and the Local Option movement. In the 1960s, the rise of the Vermont Democratic Party and the construction of Interstate 89 also contributed to the end of the Mountain Rule. Though I-89 is a north-south route, it traverses Vermont from east to west and changed the way Vermonters viewed how the state was divided.